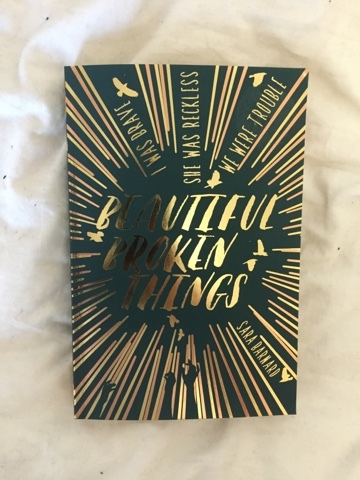 I bought Beautiful Broken Things by Sara Barnard on Wednesday afternoon, started it on Thursday morning and finished it at 2am on Friday morning. I had tears rolling down my cheeks and a strange lull in my heart. I’m not going to lie, I first picked this book up because of it’s stunning and beautiful cover as well as the vague and captivating tagline ‘I was brave, she was reckless, we were trouble.’ I didn’t expect it to touch me as much as it did. I’ve found this review quite hard to write, it’s difficult to write it without spoilers as I wanted to discuss the plotlines etc. It’s more of a discussion rather than a review, but just to warn you there are probably hints of the plot/characters throughout so read at you own risk! And she expects to do this with her absolute best friend, the sarcastic, trustworthy Rosie. They had always been inseparable, even though they went to different schools. However a new girl at Rosie’s school, Suzanne, threatens to change everything about their lives. The story is about friendship - about how you can be blinded by love and not realise the destructive qualities. It’s manipulative, it’s heart-warming and its heart wrenching all whilst being incredibly realistic and raw. Caddy is naïve. When I first started it took me a while to be get into. I liked the fact that the protagonist went to an all girls school – especially loved the description of it being an ‘oestrogen prison’ – and I liked the fact it was set in Brighton. It was believable, she was just a normal teenage girl. However she seemed too young at first, normally YA books I enjoy the protagonist is 17 or 18 and develops into a more mature character throughout the book. I felt that Caddy was very young and innocent and didn’t participate in that much character development throughout the book, shown in the last chapter. However I do also think this naivety was needed for the book. It portrays an honest portrayal of a teenager – so eager to be liked and so conscious of everyone around her. She is so eager to look on the positive side, she wants to look after her friend and fix everything. Her loyalty to stick by Suzanne’s side, and defend her (even when she shouldn’t have been defended) shows dedication and a sense of faith that is just so raw and deep when you’re a teenager. Reading this book I was inside Caddy’s head, but could also have an outside perspective. Sara writes in such a simple way but nevertheless is incredibly clever. I could see the manipulative but loving character of Suzanne so clearly, I could see Caddy’s urge to help and look after her, but also Rosie’s view on this change in their friendship, as well as Caddy’s parents views on how one girl could change everything for their daughter. She wrote with such subtly that really captivated you, I could feel my heart twisting in my chest when I realised Suzanne was changing Caddy, I literally couldn’t put the book down – I mean I turned my light off at 12:30 expecting to go to sleep but fifteen minutes later I turned on my light and read until I finished the book at 2 in the morning. In that sleepy, emotional state I wrote down words I felt about this book – Manipulative, subtle, real, heart-breaking, raw, believable, predictable, honest. The character of Suzanne is so complicated, untrustworthy but loveable. She had a vulnerability that came with her but also a dark side, Sara Barnard really captivated the way she changed Caddy – for the good and the better. She made her more reckless, more exciting but also put her in danger. There was a romantic beautiful side to the darkness that Suzanne upheld but this book was so real and raw that it scared me. Suzanne’s flippant changes of mood and her ability to put on a mask and hide parts of her life were astounding. Having the narrative from Caddy’s point of view was insightful here as you could see how believable perfect beautiful Suzanne looked. In most books or films I read/watch there is a romantic love story – and that has always been my favourite part, I love romance and I’m not ashamed to admit it (even if my friends do laugh at me.) This story is a love story, just not the romantic kind but I loved it the exact same amount. It’s a love story between friends. The first line made me laugh – ‘I thought it was a start to a love story. Finally.’ – Just the sarcastic tone instantly drew me in, it almost mocks love story’s, but also shows the unrealistic views they portray. It’s an ironic first line and it really made me laugh. I don’t know how I feel about the ending to be honest. In a way it was predictable, which should be a bad thing, but it wasn’t – it was needed. The novel needed to be wrapped up, but it wasn’t fully, and that’s what makes it realistic. The ending in a way feels slightly rushed, but that’s life. It was a realistic conclusion, it wasn’t a ‘happily ever after’ situation but a need conclusion of the past year of events. Sorry I know that is a very vague description of the ending, but I don’t want to ruin the book completely! Thanks to Lyndsey for shooting these photo's!